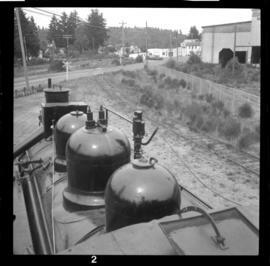 Photograph depicts the Chemainus Depot, looking southward, at mile 51.2. There is evidence of repainting and repairs the depot and immediate surroundings. 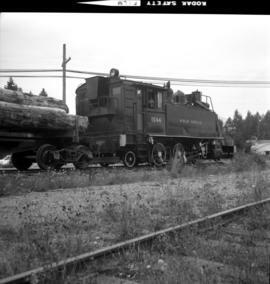 Photograph depicts locomotive #1044 on display outside the MacMillan Bloedel mill. The locomotive was built by H.K. Porter Company, Pittsburgh in 1924. 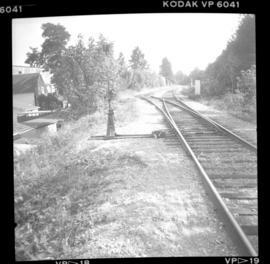 Photograph depicts part of the trackage of the MacMillan Bloedel mill between the mill and tidewater level. Visible is a disused and rotting water tank. 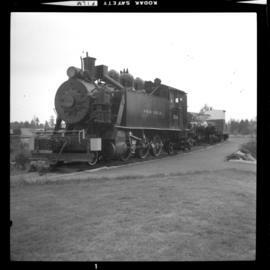 Photograph depicts locomotive #1044 of MacMillan Bloedel. It was removed from service in 1970 and placed subsequently on display. Built by H.K. Porter Company, Pittsburgh in 1924. 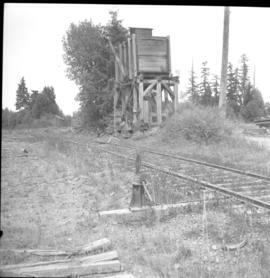 Photograph depicts a caboose on display oustide of the MacMillan Bloedel mill. The full display consisted of a locomotive, pole car, and this caboose. 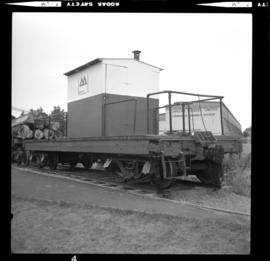 Photograph depicts the top view of a locomotve on display adjacent to the MacMillan Bloedel mill. The rectangular tank behind the chimney was a home-made central water filling device leading to the 2 side tanks. 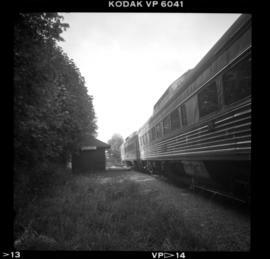 Photograph taken at Chemainus. The station is just behind the camera. The south bound train is visible and it is is just picking up speed, travelling back to Victoria. Time is 4:00 p.m. The train is well patronized. 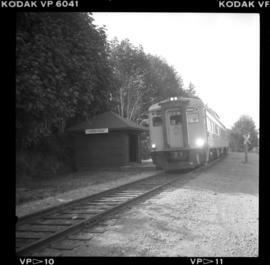 Photo is taken at Chemainus station on mile 51.2. A southbound passenger train with 2 Budd cars is visible. Time is 16:01. About 2-4 passengers got on or alighted. Photo is taken on mile 51.2 in Chemainus. 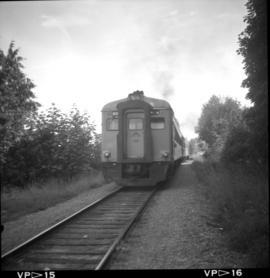 The image captures a southbound Budd car passenger train pulling out of the station for Victoria. Looking northwards. 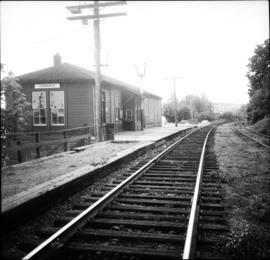 Photograph depicts the passenger depot that is to the north. 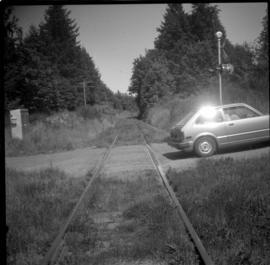 Siding (with 22 cars) lies south and at a short distance. 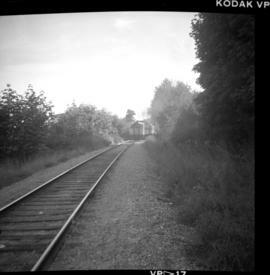 Image captured is looking towards the south at the beginning of the siding. Photograph taken at mile 50.0. 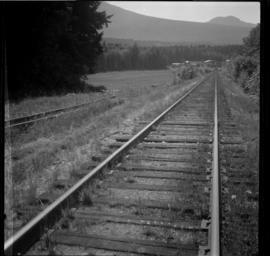 Photograph taken at about mile 53 between Chemainus and Ladysmith at Victoria Road (plantation). Image captured looking towards the south. 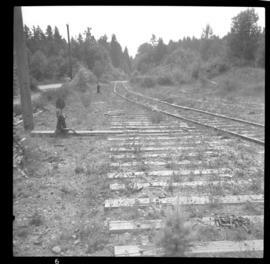 Photograph taken at about mile 53 between Chemainus and Ladysmith at Victoria Road (plantation). Image captured looking towards the north.